Early today we had reported about iPod Touch 2G 4.0 jailbreak and native multitasking demo video. 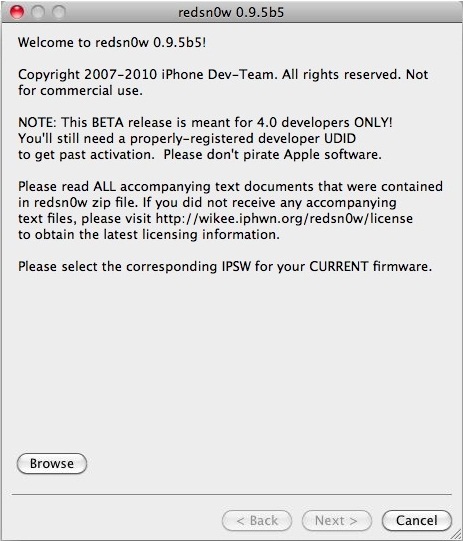 From the start iPhone dev team has been keeping their Redsn0w tool updated to jailbreak latest release beta iOS 4.0. Even though Redsn0w 0.9.5 Beta 4 can jailbreak iOS 4.0 GM candidate, iPhone dev team has once again updated Redsn0w to 0.9.5 Beta 5. But this time Redsn0w 0.9.5 Beta 5 also supports the iPod touch 2G too. Multitasking and homescreen wallpaper are now turned on by default (Apple doesn’t normally allow this on these 2 devices). Please keep in mind that Redsn0w 0.9.5 can only jailbreak and not hactivate your iPhone, you should not attempt to update to iOS 4.0 GM if you are not on official carrier. The procedure to jailbreak iPhone 3G 4.0 with Redsn0w 0.9.5 Beta 5 is same and can be followed here. Download Redsn0w 0.9.5 Beta 5. Download iOS GM 4.0 for iPhone 3G & iPod Touch 2G. We have already covered how to jailbreak iOS 4.0 on iPhone 3GS using Pwnagetool Bundles, Pwnagetool 4.0 can also help you to jailbreak iPhone 3GS 4.0. Blacksn0w is the unofficial tool to unlock iPhone 4.0 or you can follow our ultrasn0w to unlock iPhone 3G 4.0 guide. There is the way to downgrade iPhone 4.0 to 3.1.3/3.1.2. Sn0wbreeze 1.6 is also tool to jailbreak iPod Touch 2G 4.0. Thanks dude Ive been looking to jailbreak my ipod touch 2G 4.0!! Redsnow link no longer works. “jailbreak an iOS4-running iPhone 3G and enable the custom wallpapers and multitasking Apple don’t want you to have.” (ifunia iphone column)Thanks! you did it. I have noticed that the multitasking being enabled through the jailbreak isn’t true multitasking. Apps don’t appear to be “kept alive”, and the native multitasking in iOS 4.0 seems to only be a list of apps that were recently opened. Every time I click on an app in the multitask bar it reloads like it’s just starting up. Maybe there’s more to it than just switching a line in a config file from “false” to “true”. Is there something I’m missing? I tried out the multitasking feature with skype, AT&T My Wireless, U-Verse App, Tweetdeck, Facebook, and many others. The multitask bar displays the apps, but, like I said earlier, when I click an app to fast switch the app reloads like a cold start rather than returning from where I left off. Has anyone else noticed this?